Given the popularity of video over photography in social media, why then neglect having a video of your wedding? 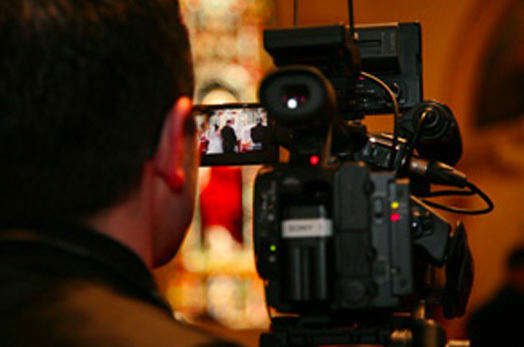 Our highly trained videographers will document all the memories of your special day forever. You’ll love watching your wedding video with your children for years to come. Frankie Carll Productions has the very best wedding videographers throughout Northeast Pennsylvania, including Scranton, Wilkes Barre, Allentown, the Lehigh Valley, Hazleton, the Poconos, and all surrounding areas. Our fully edited video packages are available for weddings, parties and other social events. We have designed several wedding video packages for couples which includes a professionally produced and fully edited video of your entire day…surely something that will be treasured for a lifetime! Our wedding video prices range from $1,595 to $2,895 with our most popular package starting at $1,895. Evening appointments are available for your convenience to discuss your event and our wedding video packages! Email or call us to schedule an appointment today 570-587-2740! Why Video? The Answer is The Day Flies By! What most couples don’t realize is how much they miss the day of their wedding. Most couples will miss 75% of what happened the day of their wedding and most couples don’t believe this before their wedding. Whether it was because you were at a table talking to family, outside for pictures, or just freshening up, the day flies by. A good wedding videographer will focus on many of the things that you would otherwise never know happened. A wedding video becomes more valuable down the road. Will you watch your video everyday? Probably not. But, in 5, 10 years after the wedding, when most of the memories have faded, that’s when you are glad you got a video. Some people think that pictures are enough. Yes, they are huge part of the day. But having the video along with the pictures adds a whole new dimension and level of emotion. You can see the tears fall from your father’s eye as you do your father/daughter dance. You can laugh as you listen to the best man’s toast. Imagine the great moment you would share with your children, to watch your wedding with crystal clear video with perfect sound and seamless transitions. They say that a picture is worth a thousand words. If that’s true, then I believe that a video is worth a thousand pictures. Frankie Carll Productions films more than weddings! We also offer video services for legal and corporate needs, such as: Deposition Video, Settlement Brochures, Day-in-the-Life Documentaries, Courtroom Playback, Wills, Forensic, S.I.U., Pre-Construction surveys, Post-Production Editing. Whether it’s for a business presentation, corporate meeting, industrial training, music DVD or marketing promotion, Frankie Carll Productions will put your company ahead of the rest. Companies such as Procter & Gamble, Tobyhanna Army Depot, Nabisco, and NEPA Alliance have turned to Frankie Carll Productions for their business video needs. Contact Frankie Carll today for more information! New Concept Video now offers you a modern state of the art video viewing room for you to relax in and enjoy the very best in video planning. We also offer DVD mailing service so you can view one of our sample DVD's in your home. Request Now!